Natural Bridge is one of my favorite features in Bryce Canyon National Park, spanning 85 feet across. Ironically, Natural Bridge is actually an arch. Mother Nature is always hard at work shaping Bryce Canyon Country’s awe-inspiring rock formations. But what actually distinguishes a natural bridge from an arch? A natural bridge starts out as a walled cliff and is then altered primarily by erosion from a moving water source, such as a river. A natural arch is influenced by other forces of nature such as water, wind, chemical weathering and frost wedging. Natural Bridge is a testament to a combination of natural forces—proving just how vulnerable even the most massive rock formations can be. 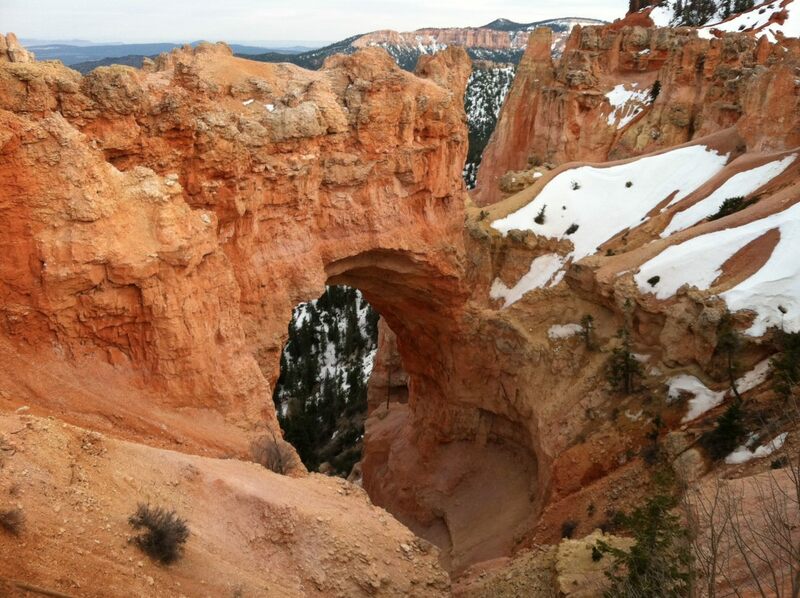 The Natural Bridge viewpoint is about three-quarters of the way along Bryce Canyon’s scenic drive.